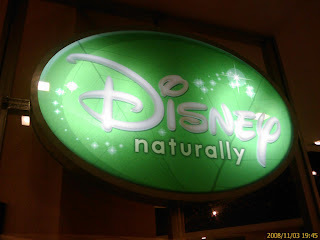 Disney naturally, Food & Fun Place for your Family and Kids! This place could be considered as a nice weekend spot for the family especially with toddlers/ children age ranged from 2 to 12 year old. 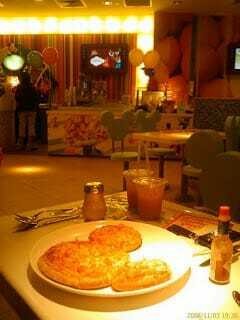 A place you may like to bring your children for a kid-entertainment filled eating place. 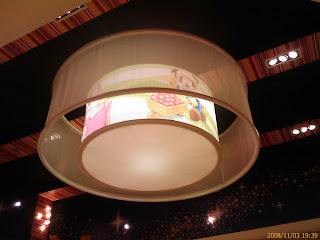 Even the ceiling is decorated with photos of Mickey’s family. A very large LCD screen showing famous cartoon with daily change of cartoon titles. 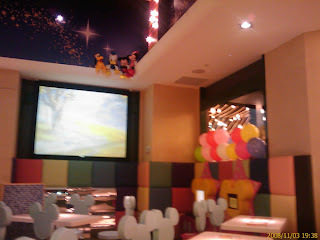 Children may enjoy themselves with the cartoon while having their meal. Of course, not so good for the digestion, but what’s so big deal for having some indiscipline on the table once in a blue moon (smiling)?? Counter on the left for you to order food and payment, and for you to shop for some stationaries printed with Disney cartoon characters. All about Disney! The counter on the right side of the photo, is where they have their fruit juices and food prepared. 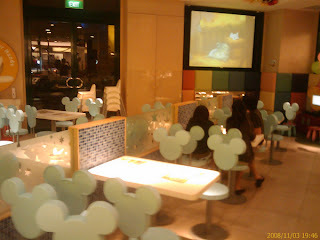 Even the chairs are the shape of Mickey’s head. Chairs are not stationed but movable, even though they are with metal stand that looks fixed. Come to the menu, a two-sided colour laminated card. One side for food and the other side for drinks, mainly food juices which claimed to be pure and vitamins-filled. 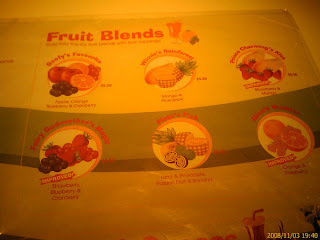 They feature their popular drinks of blended fruit juice cost about S$5.50 while single fruit juice costs about S$4. They offer only only 4 categories of food i.e. 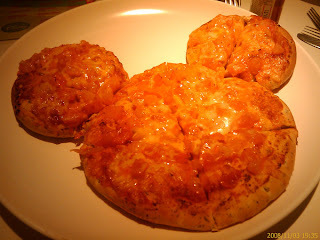 Mickey Pizzas (about S$13.90 – $15.90), Stewed dishes (about $9.80), Burgers, and Pasta meals (about $9.90). 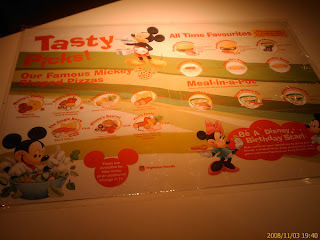 The food portion of Mickey pizza is quite large that good for 2 – 3 person sharing. The pizza tastes pleasant. The texture of its pizza crust is too soft, more like bread than crust. 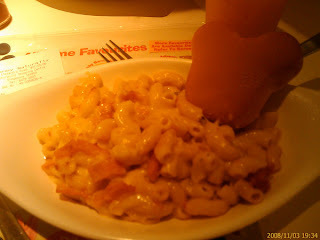 However, I like soft texture, and I think it’s more suitable for children’s appetite (chuckling). Chicken stew with Mickey-shaped dinner roll is good, too, but the dinner roll is too hard on outer layer (harder than french loaf)! Luckily, inside of the bread still soft enough. 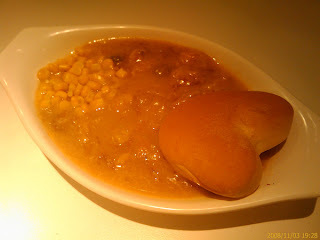 I like the sweet corn in the chicken stew which goes well with the meaty taste. Cheese macaroni tastes like home-cooking. Too simple, and too little toppings of hams. Not sure why it’s served with a Mickey dinner roll here as it does not have any sauce to dip with. However, with an additional dinner roll, I used it to dip my unfinished chicken stew sauce. Just nice to finish up the remaining stew sauce though (laughing)! 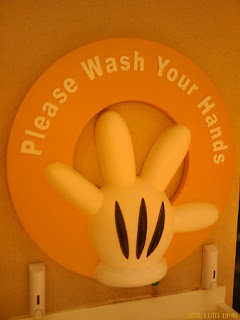 This is the place for you and your children to have a hand wash, before and after meal. If you intend to bring your family there, just don’t expect succulent food and excellent taste. 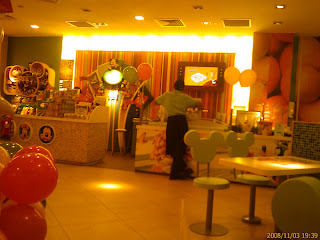 Bring your children there, for some fun and enjoyment of Disney cartoon characters. Or, some sweet childhood memories for yourself, and your loved one. Tips: If you are looking at budget/ very promotion deals, go on a weekday! They offer set meal of $8 to $10 for 1 meal + 1 fruit juice. It’s as good as 60% discount whole day long (both lunch & dinner, anytime)! Add ons: Forgot to tell you that this Disney Restaurant is located at Anchor Point Shopping Centre, just opposite Ikea @ Alexandra. Nice to see you again! I also did visit your site. Pretty often indeed! Yes, good for the kids. Not necessary must be lunch, you know? Their weekdays offer is day-long, which means even dinner is on offer during the weekdays!